Unterweg Drawings Nr. 4 – March! Lots of amazing unterweg drawing opportunities already this month! 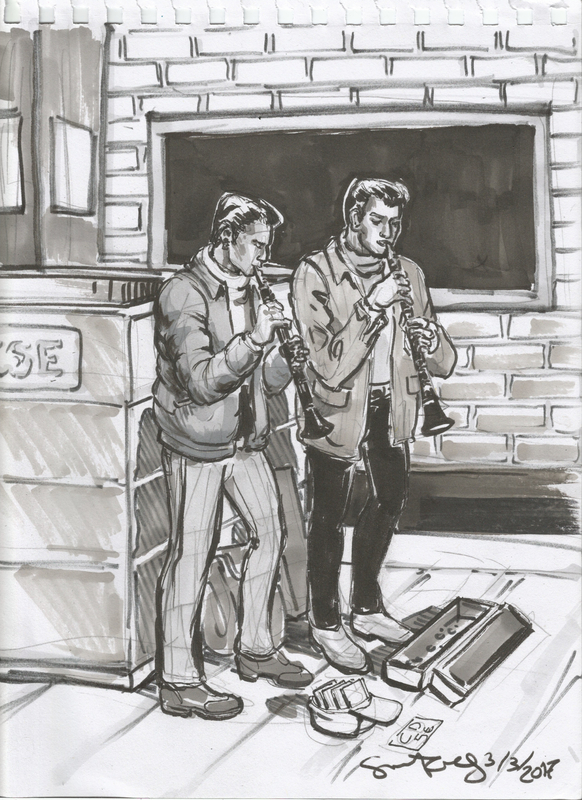 These clarinet guys were reconstructed from a glimpse while my train was stopped at the platform they were on. I focused on details like their different styles of coat, their backpacks behind them, their hairstyles- so I not only didn’t get the specifics of the station, I don’t remember what station it was! Me and Daria went to a cafe in a cemetery, and it was the most wonderful place you could ever imagine. I’m not telling which one, cause it’s too precious. 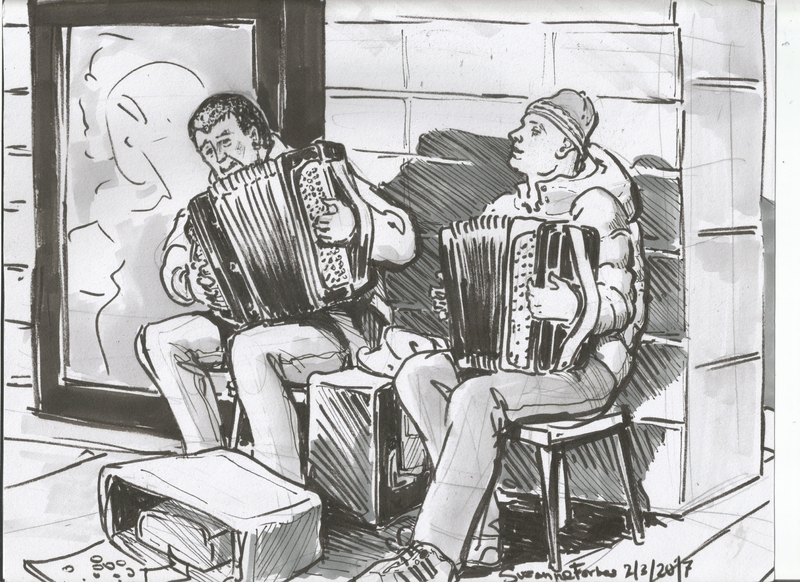 When we left we saw these accordionists in the station, and she got on her train but I stayed to draw them. Using the set of grayscale markers I received as a 50th b-day gift from a beloved friend-muse-Patron has been so fun and rewarding. Also the cafe there, Rock-Paper, has fantastic American style chocolate chip cookies. Better than serviceable Snap (which luckily has just opened a branch in our U-Bahn station), better than decent Scoom, even better than quite good Shakespeare and Sons. If you are in Berlin and your heart is aching for a real, American, gosh damm actual chocolate chip cookie, you should go to Rock-Paper. On the way there and I back I drew this guy with the longest longboard I had seen since the early 80s. He said it was 1.4m. 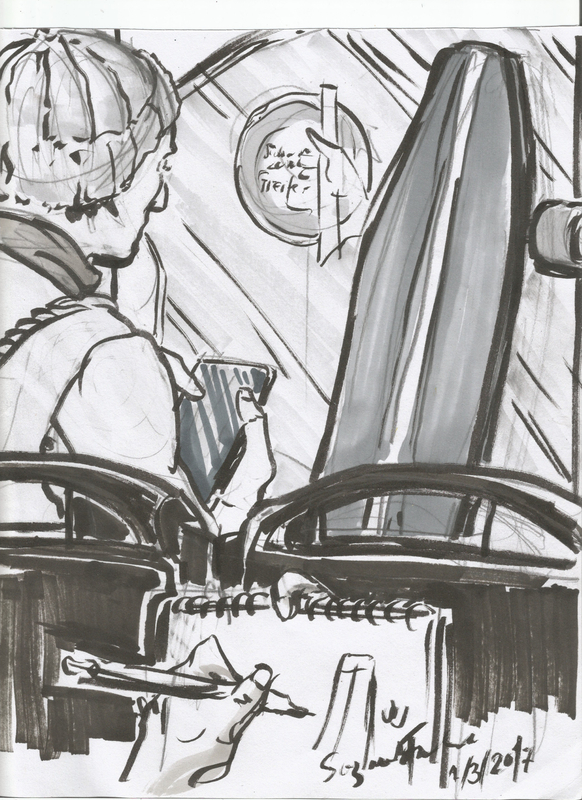 This entry was posted in Berlin, My art and tagged "Glücklich in Berlin", art in berlin, Berlin, chocolate chip cookie Berlin, Daria Rhein, drawing, drawing in berlin, life drawing Berlin., live drawing, modular, portrait drawing, Suzanne Forbes, Suzanne Forbes art, Suzanne Forbes artist, unterweg on March 4, 2017 by Suzanne Forbes.